Buy Jason Moisturizing 84% Aloe Vera Conditioner 473ml in the UK from our online shop or directly from our independent Scottish store. This Deep Moisture Conditioner deeply hydrates dry, stressed hair that’s prone to static and breakage. Aloe Vera, Spirulina Maxima and Jojoba Seed Oil deeply nourish and restore hair’s natural moisture balance while Equisetum Arvense Leaf Extract and Vitamin E add healthy luster. Renewed with silky moisture, your hair shines with soft manageability. Safe for colour-treated hair. As official Jason stockist, we sell genuine Conditioners directly from our shop in Scotland and online throughout the UK. Where can you buy real Aloe Vera Conditioner safely online? If you are wondering where you can buy Jason Moisturizing 84% Aloe Vera Conditioner 473ml safely online in the UK, then shop with us. We are an actual health foods shop; with real people selling real foods and products. Our award-winning independent shop is located in Stirling, Scotland since 1976. You can buy our Natural care products and other genuine Conditioners in store or safely place an order with us online or over the phone. 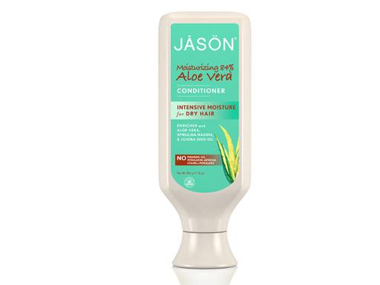 Aloe Vera Conditioner - Jason Moisturizing 84% Aloe Vera Conditioner 473ml in Conditioners and Hair Care.